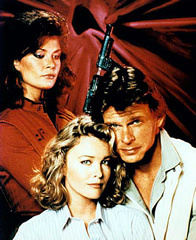 Performers include: Marc Singer, Faye Grant, Jennifer Cooke, Michael Ironside, Mickey Jones, Blair Tefkin, Michael Durrell, Jeff Yagher, Lane Smith, Aki Aleong, Michael Wright, Nicky Katt, Jenny Beck, Jane Badler, June Chadwick, Frank Ashmore, Robert Englund, Duncan Regehr, and Judson Scott. This series, about a group of aliens known as “The Visitors,” got its start on the small screen as a mini-series. The Visitors first appear as humans and arrive on Earth under the pretense that they need to try to obtain chemicals to resuscitate their dying planet. Their real reason however is to take over Earth, steal all of its water, and feast on humans as food. A group of rebel forces, journalist Mike Donovan (Marc Singer), Dr. Juliet Parrish (Faye Grant), Ham Tyler (Michael Ironside), and Willie (Robert Englund), fight the First Invasion and succeed. However, as the series begins, the fight has truly only just begun. The Visitors are led by their Queen, Diana (Jane Badler). After the First Invasion, she is captured by Donovan and put on trial for her crimes against humans. Nathan Bates (Lane Smith) puts together a plan to stage an assassination of Diana on the way to her trial and then takes her captive. Nathan makes promises to Diana that he’ll fulfill only if she’ll help solve Earth’s environmental problems and cure diseases. Donovan and Martin (Frank Ashmore), a member of the Fifth Column group who oppose Diana’s plans, want proof that she’s been assassinated and they head off to track down those responsible. They discover Diana is alive in a cabin in the woods. She manages to escape her captors and promises to return to Earth for the Second Invasion. The Resistance gathers again to battle The Visitors but can they save Earth twice? WHEN is the series on TV & where?? What is advertised IS NOT ON ABC at any times or stations in Nashville?? Says 7pm and also 12 or 1 am… tues, wed, thur? TV guide does NOT show it! @Doris: The new V series is usually on ABC at 7pm central time. It looks like your local station is running “Titans on 2 with Jeff Fisher” instead and putting V on after Jimmy Kimmel late at night. I’d watch it online at ABC.com to catch up.